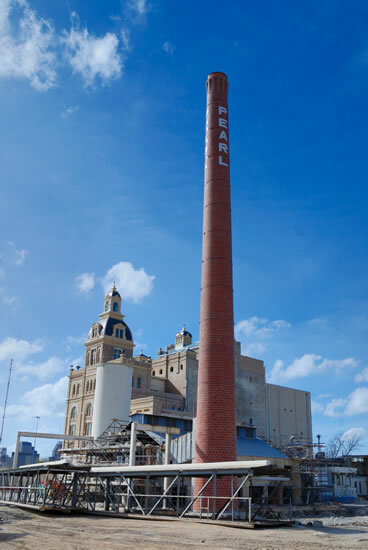 Over the holidays I was invited to check out The Pearl Brewery in San Antonio currently under renovation. 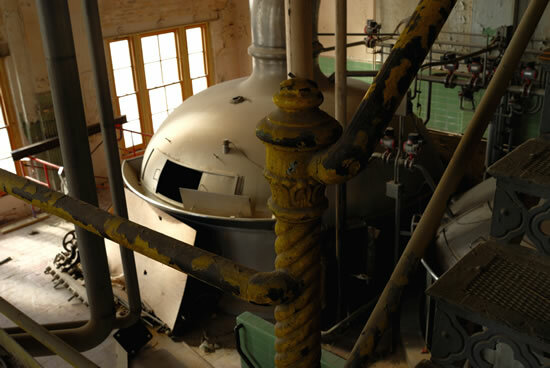 The focus would be on the Main Brewhouse. Of course I was excited because I had only been wondering what was inside this place for about the past 8 years or so. I invited my friend Angela and my long time exploring buddy, Vitali who has been dreaming about that place for as long as I have. 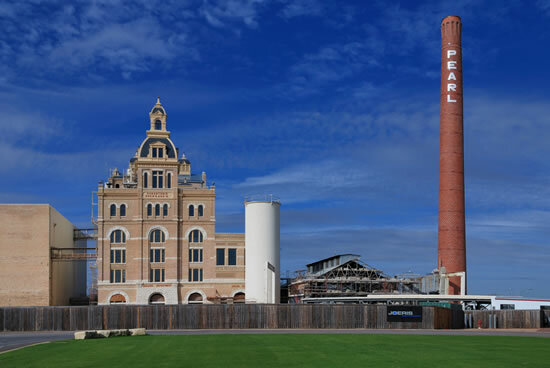 For those uninitiated, Pearl is a Brewing company that was established in 1883 and while they survived prohibition they were eventually bought by Pabst and when economic problems struck in 2001 they were forced to close this San Antonio Landmark. 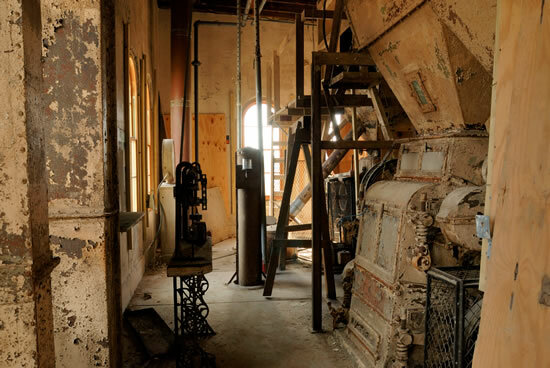 Now in the years since work has been done to restore and reuse what was once a nationally known beer brewery. They hope to make it a place thst you can live, eat, shop, work and learn. 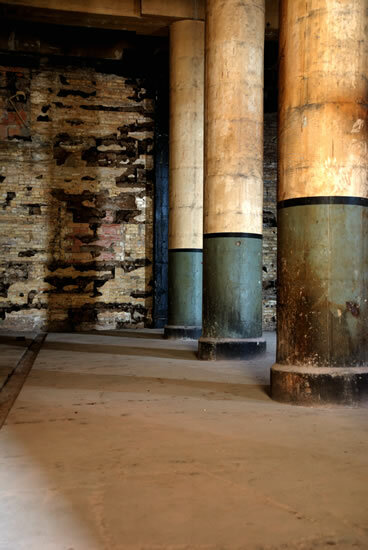 For many years the outside of the smokestack and most of the buildings were painted with white wash. 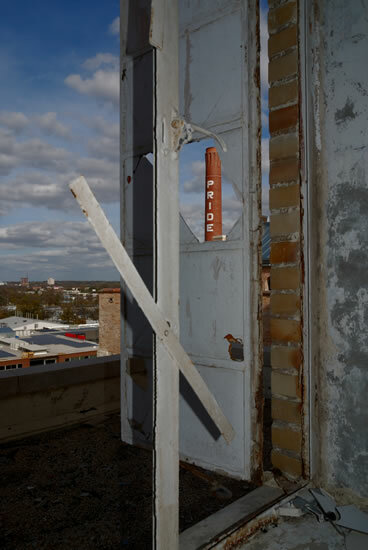 When they removed the paint from the smokestack they found that the writing was done by using white bricks while the rest of the stack is made with red. “PEARL" is only spelled out on two sides... the side that faces the brew house spells out "PRIDE", likely to instill pride in the employees. The Brewhouse under renovation. This is where we spent most of our time on the tour. 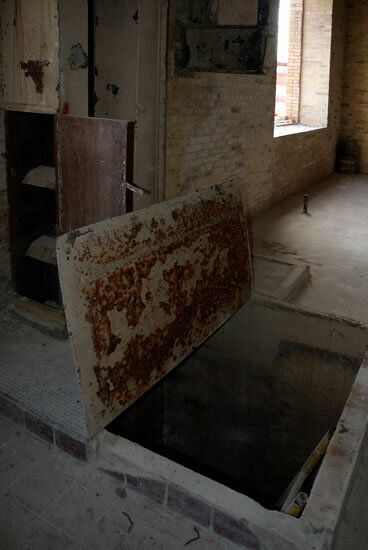 This is a scoop elevator for the grain used to make Perl Lager. 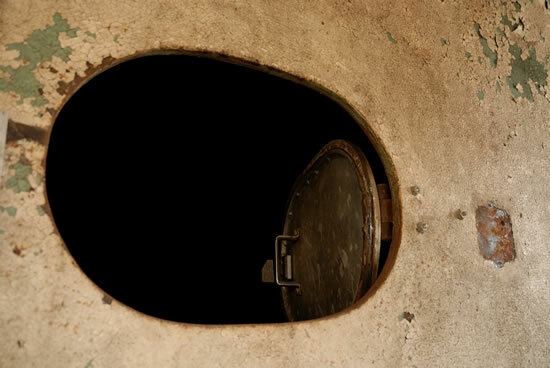 This is one of the stainless steel brewing vats still left behind. It will likely be integrated into whatever this area will end up being. Here is another look at the brewing vats. This is how the brewing vats look inside. 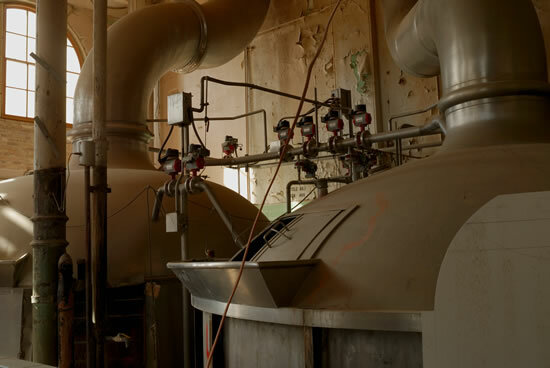 You can see the sprayers above, a heating element and the pipes used to transport the liquid to another area once the process has finished. 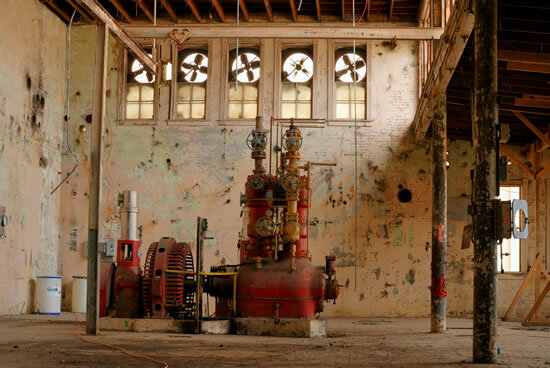 Ideas for the use of this building after restoration have changed many times since the brewery was bought. Different possibilities include office space, clubs and bars, music and event venues and more. 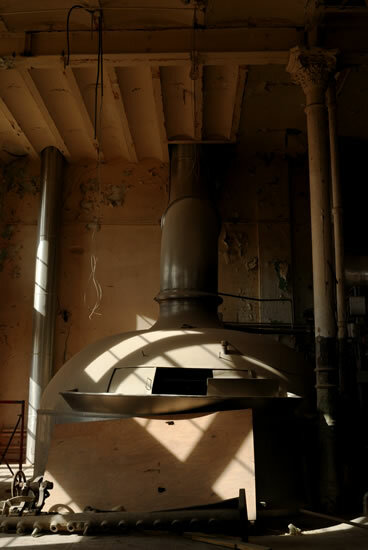 I was told that they are trying to keep the look of the building as original as possible and I hope they do because even if this was once an industrial plant, it is still full of gorgeous architecture. This is a mixing device that came out of one of the brewing vats. These stairs are decorative even though it only serves an industrial purpose. It seems that brewers are always very proud of their breweries. 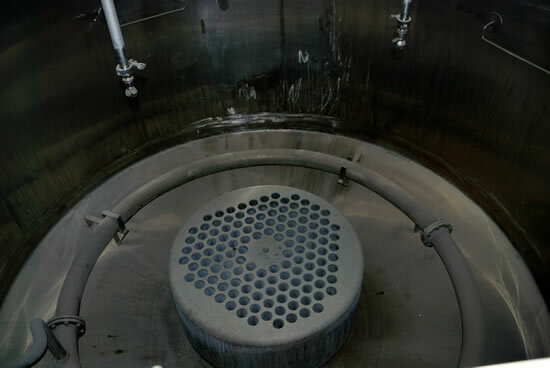 This is a familiar type of industrial scale used in all types of food production. More grain hoppers. I like these because they have little windows that allow you to see what is going on inside the machine. 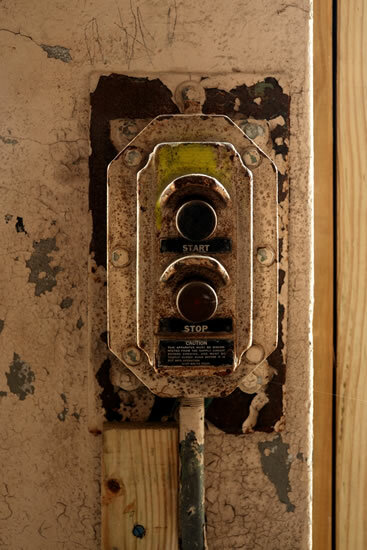 Not sure but I think this is the start and stop controls for the grain hopper. 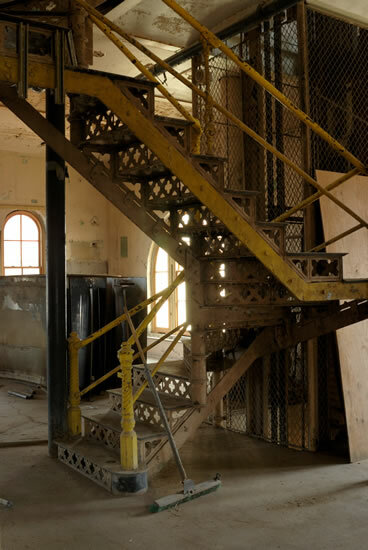 Here is one of the many yellow painted spiral stair cases in a vertical panorama format. There are also the exact same style staircases in the Lone Star Brewery... coincidence? 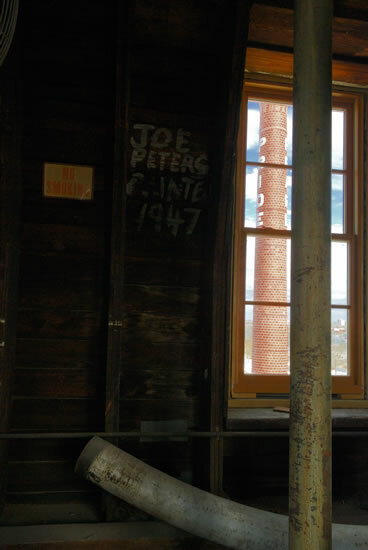 A bit of graffiti from 1947: Joe Peters Painter... or is that Joe Peters, Painter? Here you can also see letters spelling "pride" on the smokestack. 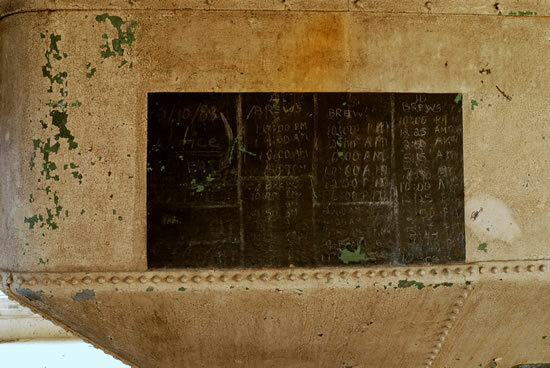 When they removed the paint from the smokestack they found that the writing was done by using white bricks while the rest of the stack is made with red. 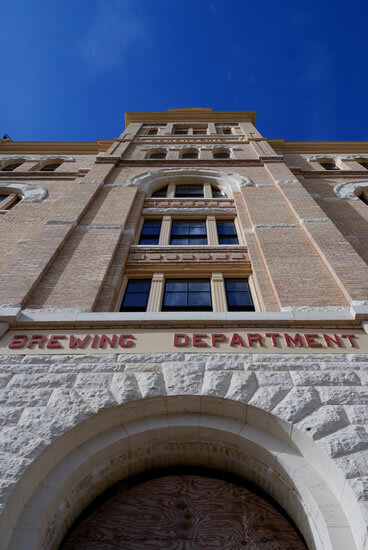 “PEARL" is only spelled out on two sides... the side that faces the Brewhouse spells out "PRIDE", likely to instill pride in the employees. 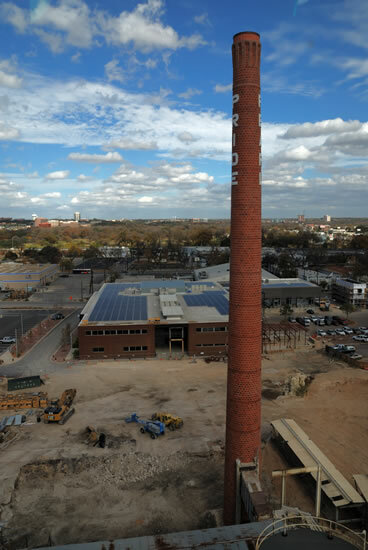 Here you can see that the side of the smokestack facing the Brewhouse says "PRIDE". Behind the smokestack you can see the Full Goods building. From this view you can see the oval shaped building is the Pearl Stables, once the place where the horses were kept that they would use to deliver the finished products and now an event venue and theatre space. 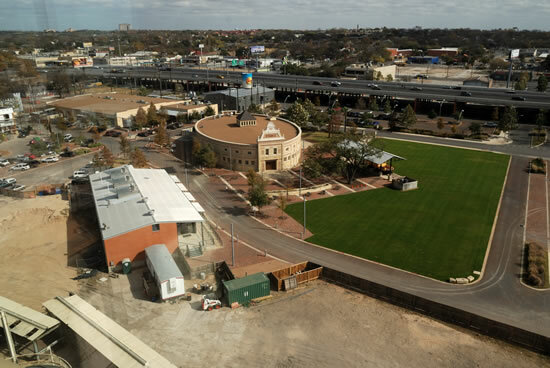 The rectangular building in the left front is now the Center for Foods of the Americas and in the left rear you can see the Aveda institute in the building that was once the Garage when horse drawn delivery became obsolete. 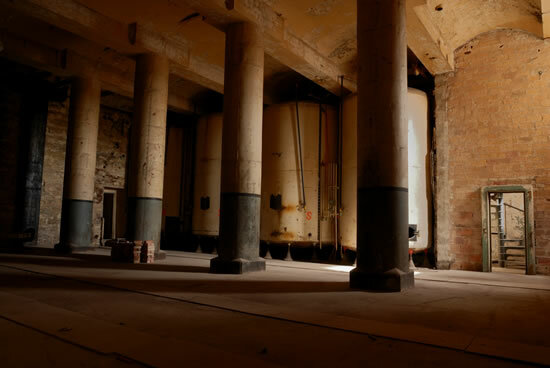 This room on the ground floor still has a few of the vats. 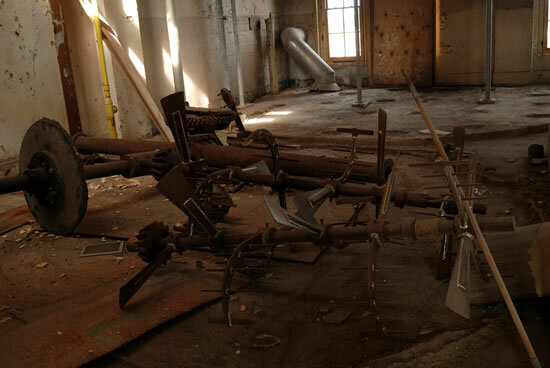 Most of the floors have all of the equipment removed. This floor might make a good bar or club. 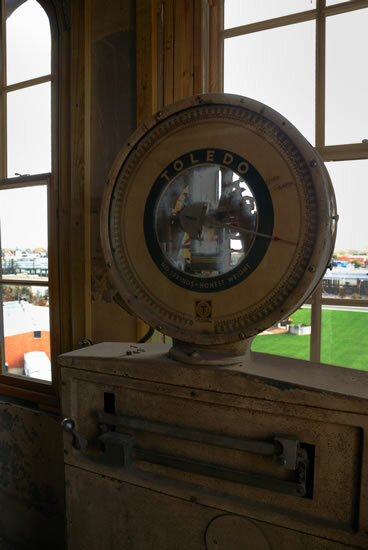 Here is another leftover piece of equipment - some kind of electrical turbine, possibly used to pump the liquid to different parts of the brew house. Here's another view of the electrical turbine or pump. 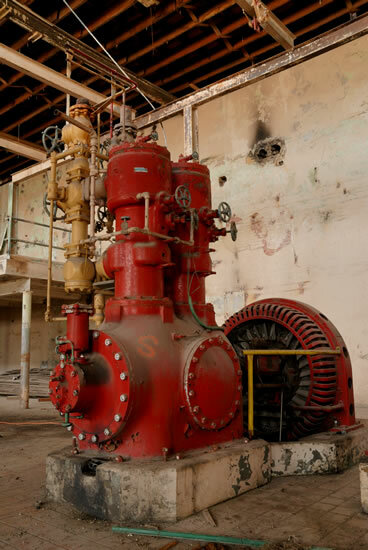 Here's another view of the electrical turbine or pump. 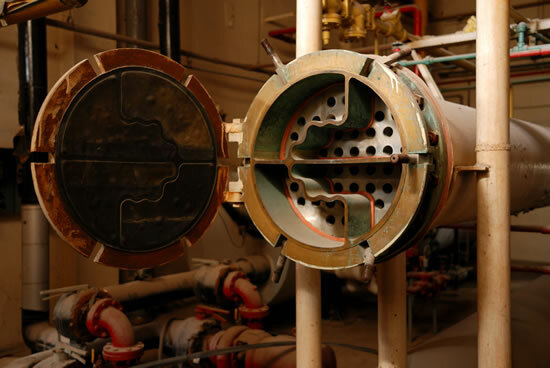 This is what the inside of the liquid transport pipes look like. 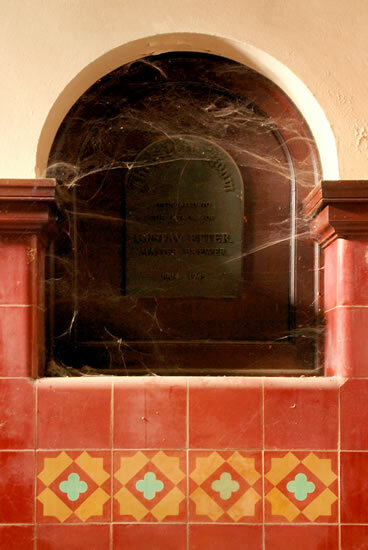 This pipe terminates in the room containing the “Beer De-Esterizer and De-Alcoholizer system”. I assume they had a non-alcoholic version of Pearl Lager but I can’t seem to find any information on it. 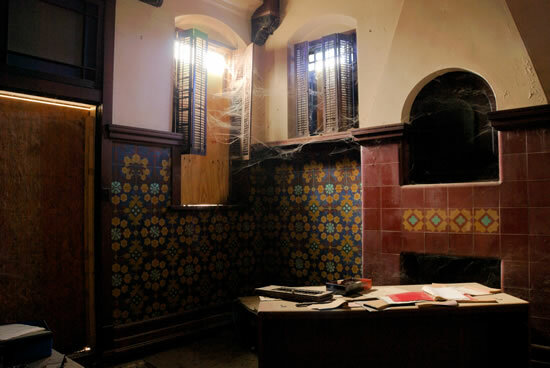 This is the Stein Room. There are lines on all of the pillars on all floors of this building. These lines were guides to assist the workers in keeping the correct liquid levels in the vats during the brewing process. 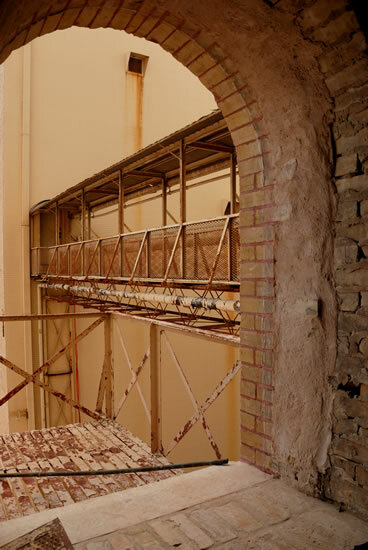 This is one of several foot bridges from the Brewhouse to another building. 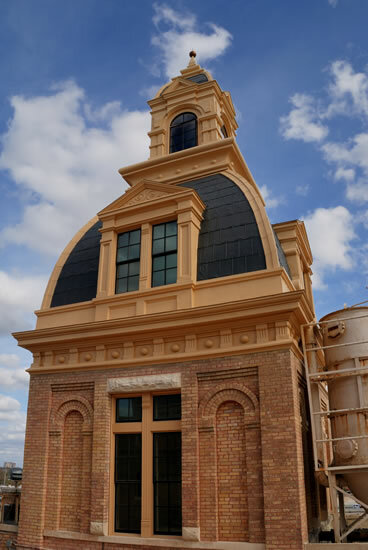 Here is a good view of one of the charcoal colored rooftops. This is the original color. A long time ago they changed the color to gold probably the same time they decided to whitewash the buildings. Now they are as they were when they were built. Photos #19 and #20 were taken from the tiny room at the top of this building. The tour group (from left to right) Angela, our tour guide Danny, Vitali and myself. 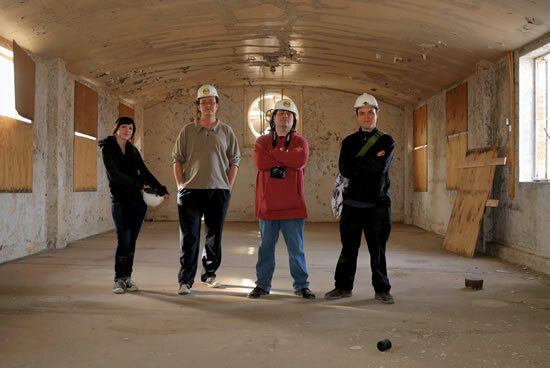 We had a great time learning the history and taking in the sites of such a historic and beautiful building.